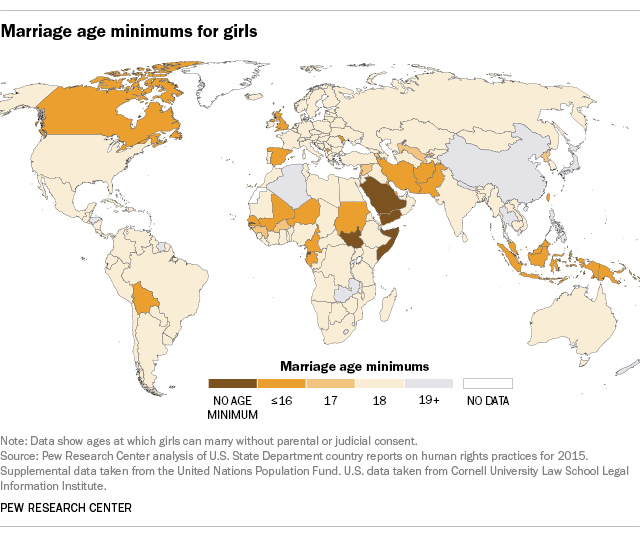 Almost two thirds of countries allow children to marry. If current trends continue, the number of girls who marry as children will reach nearly one billion by 2030. That’s according to the UN, which launched an initiative earlier this year to protect girls from child marriage. Girls who marry as children are less likely to achieve their full potential. They are more likely to leave education early, suffer domestic violence, contract HIV/AIDS and die due to complications during pregnancy and childbirth – their bodies simply aren’t ready. But child marriage also hurts countries’ economies. It damages social and economic development and leads to a cycle of poverty between generations. And yet, at least 117 countries around the world allow it to happen, according to the Pew Research Center. However, almost two thirds of the countries (117) allow children to marry. Even in countries that stipulate a minimum age of 18, many have exemptions to the rule. An 18-year-old in Australia, for instance, can marry a 16-year-old as long as they have judicial approval. 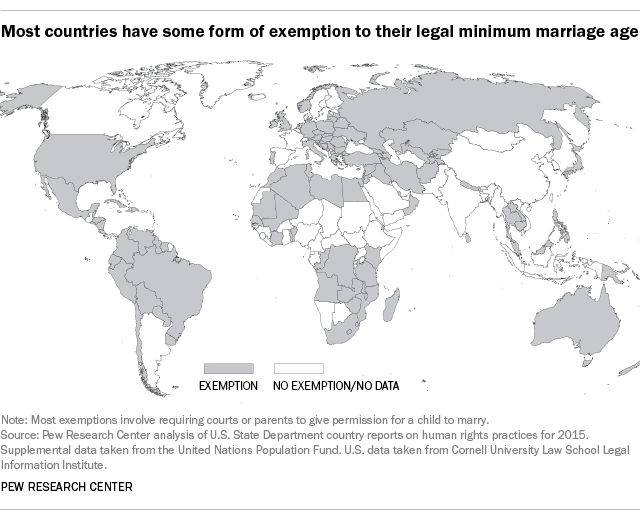 In Iraq, Jamaica and Uruguay, children can marry with parental permission. In about one fifth of countries (38), there are different minimum ages for men and women, and almost always the girl is younger. For example, in Bangladesh, women must be 18 and men must be 21 to marry. In Sudan, girls can marry at 10 and boys can marry at 15 or at puberty. Sometimes the marriage age depends on religious affiliation. In the Philippines, Muslim boys can marry at 15 and Muslim girls can marry at puberty. In Tanzania, Muslim and Hindu girls can marry at 12 as long as the marriage is not consummated until the girl reaches the age of 15. One of the ongoing issues is that in many countries, many minimum age requirements are ignored, even if they are enshrined in law. For example, in Afghanistan, the legal minimum age for marriage is 16 (or 15 with the consent of a parent or guardian and the court) for girls and 18 for boys. However, international and local observers continued to report widespread forced and early marriage. In Albania, although the legal minimum age is 18, under-age marriages continue, mostly in rural areas and within Roma communities. According to action group Girls Not Brides, one in three girls in the developing world are married before the age of 18.